I’ve been a busy bee. But this is only the second week of classes. As busy as I think I am now, I will be so much busier in ten weeks. I haven’t had much time to miss Canada yet, but I’m sure I’ll get there eventually. For now the weather’s too warm here to want to go back. This outfit is a bit different from the others I’ve had on here. I’m wearing a necklace I got at NafNaf in Paris and if I were to go out in this outfit, I’d wear my white strappy sandals with it. 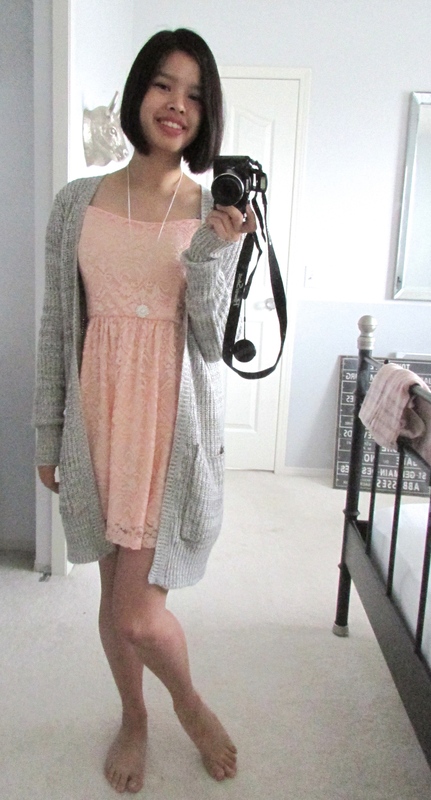 It’s pretty simple with a pink lace dress and a long cardigan. Girly, but still casual and comfortable. The thing is, I got the dress and cardigan for $5 each off of kijiji (which is like craigslist or ebay, for those who don’t know). Over the summer, I became a bit strapped for cash, so I had to find a cheaper way to build my back-to-school wardrobe. I might do a post on how I saved money in the future. Let me know if you’d be interested. So what did you think of my cheap choices? Leave a comment below!